Our 50 Golden Years celebration on 20 August 2016 was all about people. 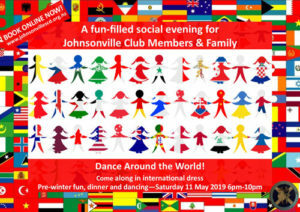 It was an opportunity to recognise all those who had contributed to the club across the last 50 years, and a chance to bring them together for a night of dancing, music, fun and friendship. Club President Kristin Downey searched club archives to identify and track down many of Johnsonville’s past tutors. It paid off on the night with a total of 14 past and present tutors attending – from 1968 tutor Garry King to current tutor Rod Downey. To recognise their contributions, the Club presented tutors with flowering golden polyanthus plants. Appropriately, the presentations were made by some of the 20 past and present officebearers who attended.